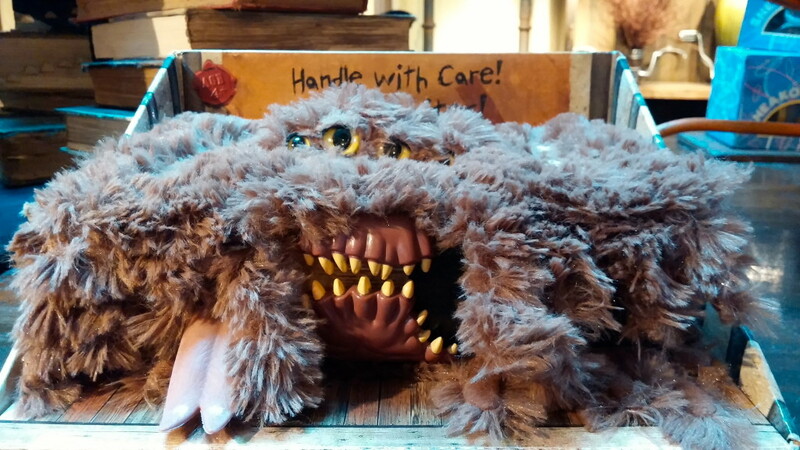 I sent Christa Thompson, aka the Fairtytale Traveler, on a mission to photograph her favorite Harry Potter souvenirs at Hogsmeade Village in Orlando’s Wizarding World of Harry Potter at Universal Studios (soon to be joined by Diagon Alley shops). Check out Christa’s fabulous photo finds below! It’s understandable why muggle children don’t get very excited about back-to-school shopping. An afternoon spent in office supply stores searching for pencils and notebooks, followed by a trip to a department store for some “nice” pants and new shoes, all the while dreading the return of homework is enough to ruin anyone’s afternoon. 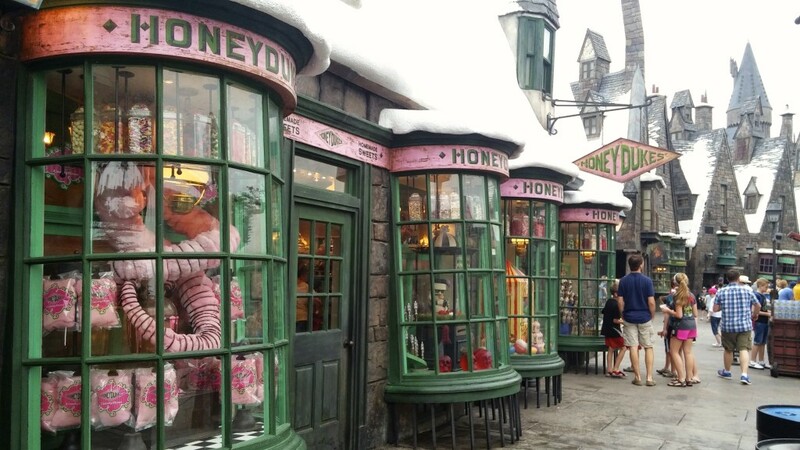 Harry Potter Shop Facades Only– Don’t try to shop here! 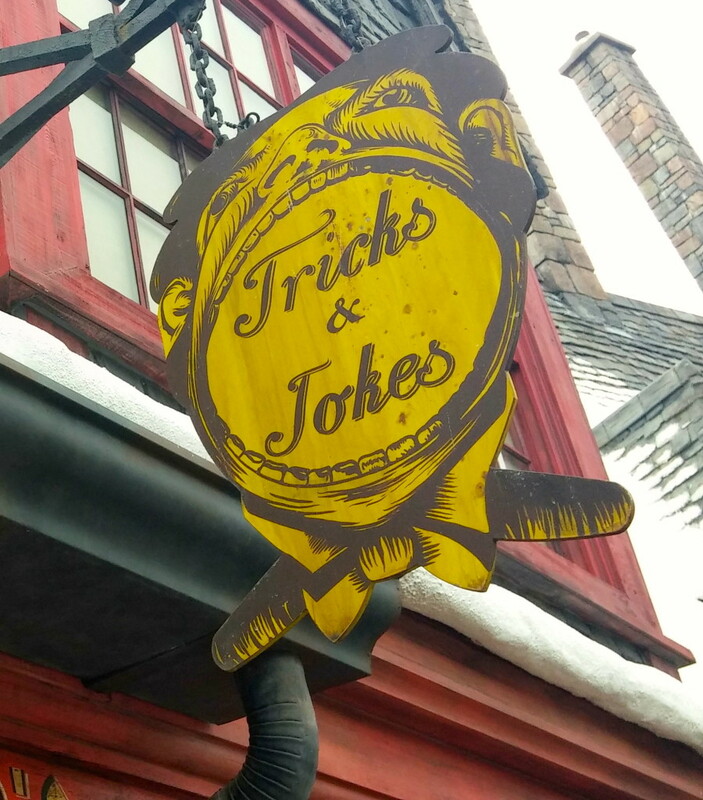 There is no one “gift shop” at Harry Potter’s Wizarding World– instead Hogsmeade village is made up of multiple separate shops, designed to reflect the actual independent shops portrayed in the Harry Potter books and movies. 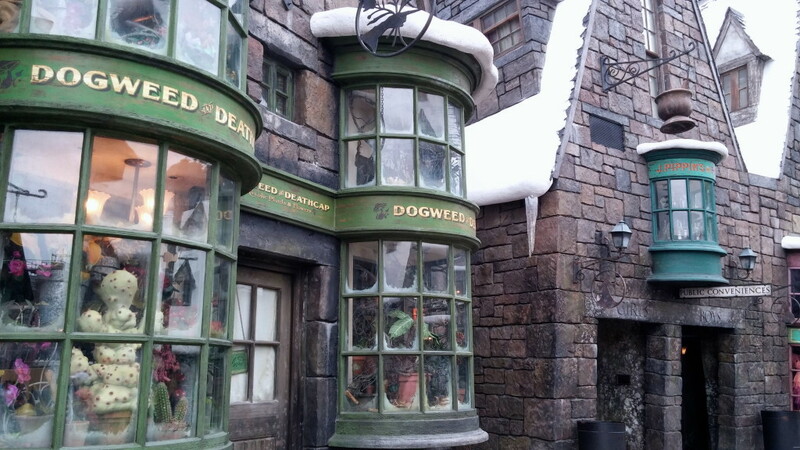 Most shopfronts in Hogsmeade village are real stores that you can actually walk into and shop. Other shopfronts are only facades (while you can’t actually shop at them, they are still fun to peek through the windows). 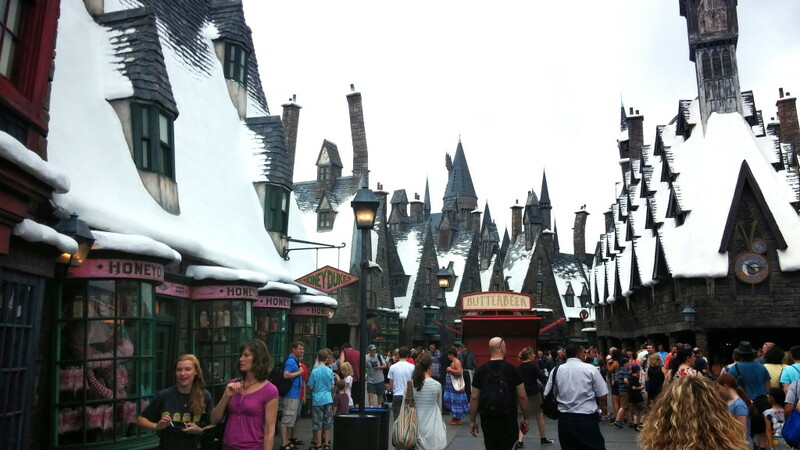 Universal Studio’s version of Hogsmeade almost feels like you are walking through a real wizarding village- but instead of greeting other wizards like Harry and Weasley, you’ll have to dodge mobs of shorts-wearing tourists. There were shelves upon shelves of the most succulent-looking sweets imaginable. Creamy chunks of nougat, shimmering pink squares of coconut ice, fat, honey-coloured toffees… there was a large barrel of Every Flavour Beans, and another of Fizzing Whizzbees, the levitating sherbet balls that Ron had mentioned…Drooble’s Best Blowing Gum…the strange, splintery Toothflossing Stringmints, tiny black Pepper Imps (‘breathe fire for your friends!’), Ice Mice (‘hear your teeth chatter and squeak!’), peppermint creams shaped like toads (‘hop realistically in the stomach!’) , fragile sugar-spun quills and exploding bonbons. I love that you can walk straight into Honeydukes and buy the very same sweets described so vividly in the Harry Potter books. u no poo and jumping snakes from Honeydukes sweets shop. 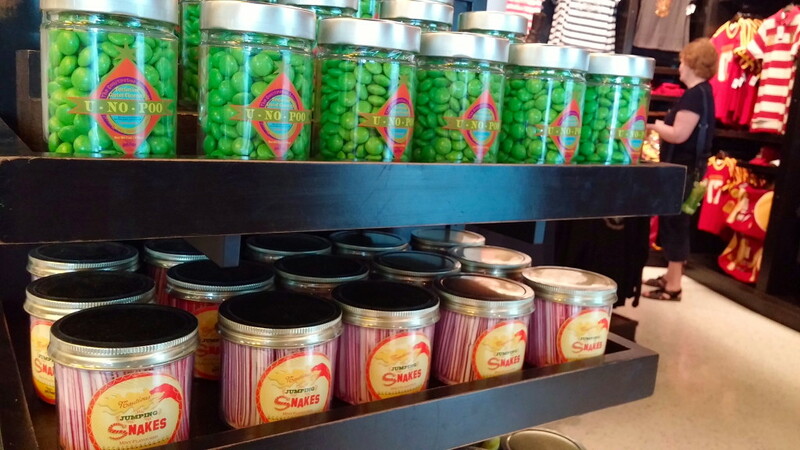 At Honeydukes, be on the lookout for favorite Harry Potter sweet souvenirs like Bertie Bott’s Every-Flavour Beans, Chocolate Frogs (with wizard trading cards inside), Cauldron cakes, Fizzing Whizzbees, Acid pops, exploding bonbons, lemondrops, Chocolate Wands, Fudge Flies, Peppermint Toads, Candy Floss, Exploding Bonbons, Pepper Imps and more. At the Tricks and Jokes souvenir shop, find gag gifts like Chinese Fortune Sticks, Crazy face flyer, Jacob’s Ladder, Screaming Yo-yo, Duck on a bike, Extendable Ears and Rubby O’ Chicken, among others. In the Harry Potter books, Dervish and Banges is described as featuring magical musical instruments and other wizarding goods like Spectrespecs and Omnioculars. Need family brooms, vintage brooms, toy brooms or racing brooms? Look no further than this shop. 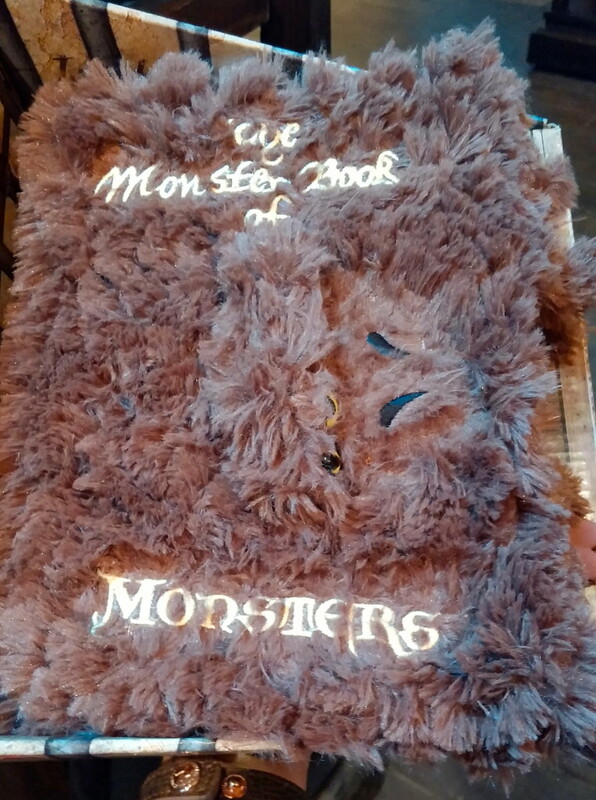 The giant, furry Monster Book Of Monsters is a delight. Flick the power switch and watch the monster book come to life. Ready for some quidditch? Look for these brooms that feature adjustable foot pedals and light-up broom bristles. 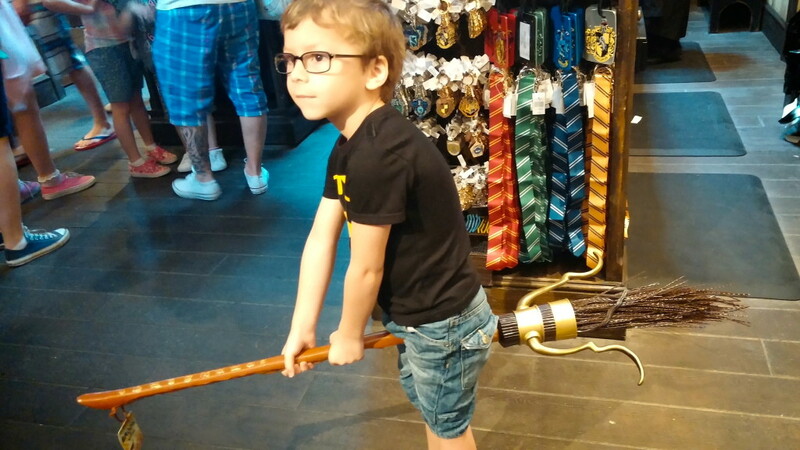 The Little Fairtytale Traveler (Christa’s adorable son) test drives a quidditch broom. Of course no quidditch competition is complete without the big prize– this Triwizard Cup with light-up stem. Another souvenir favorite– the Ireland Quidditch World Cup pin. The Golden Egg Opening Pin (modeled after the golden egg from the Twizard Tournament) opens to reveal a pearly egg inside. You’ll find other quidditch accessories like sweaters, Golden Snitches, Bludgers, Quaffles and these House crest banners, waved by Hogwarts students to cheer on their favorite house in the quidditch matches. 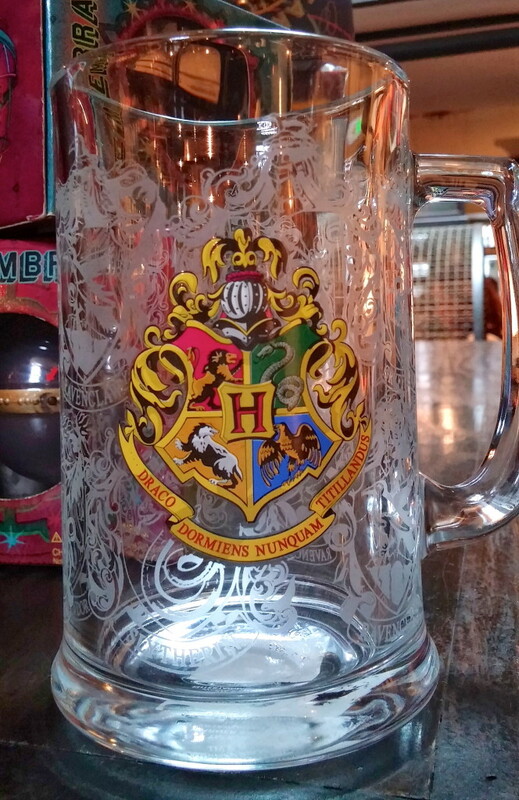 If you’re looking for a more practical souvenir this Hogwarts crest glass stein will be sure to get plenty of use back home. Less practical, but utterly irresistible are these Hogwarts’ House robes (priced up to $120, ouch! ), modelled by the Little Fairytale Traveler. The fairytale travel models a scarf. There are plenty of less spendy, wearable Hogwarts souvenirs– like this house tie and scarf (as modeled by the lovely fairytale traveler). 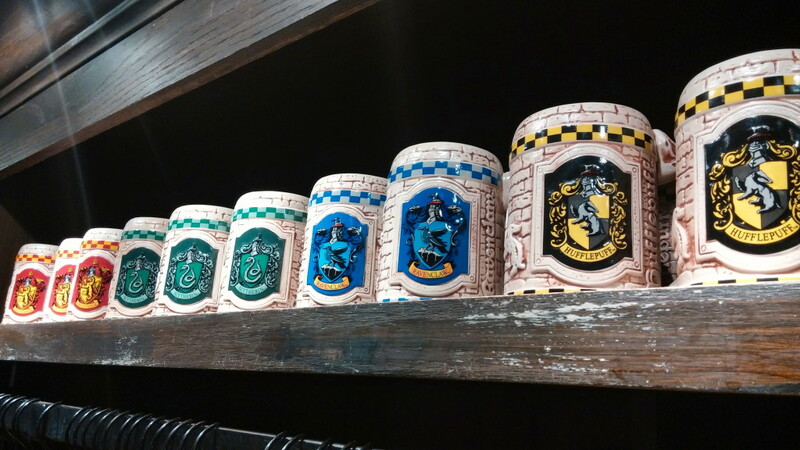 Pick up a sturdy mug from your favorite Hogwarts house. 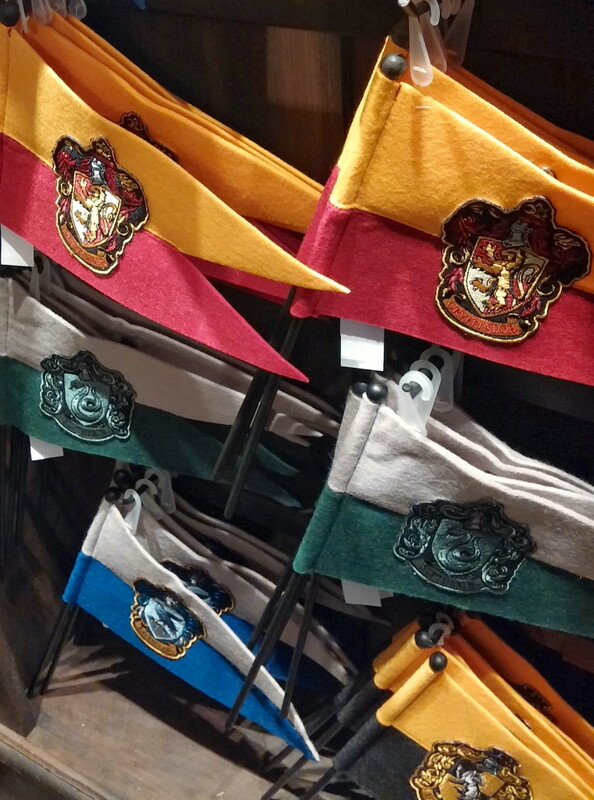 Smaller items like Harry Potter key chains, pins and magnets make great wallet-friendly souvenirs. Want to get the kids off the computer? Inspire them with some Hogwarts stationary and journals from their favorite house. And of course it’s impossible to leave Hogsmeade village without a wand. 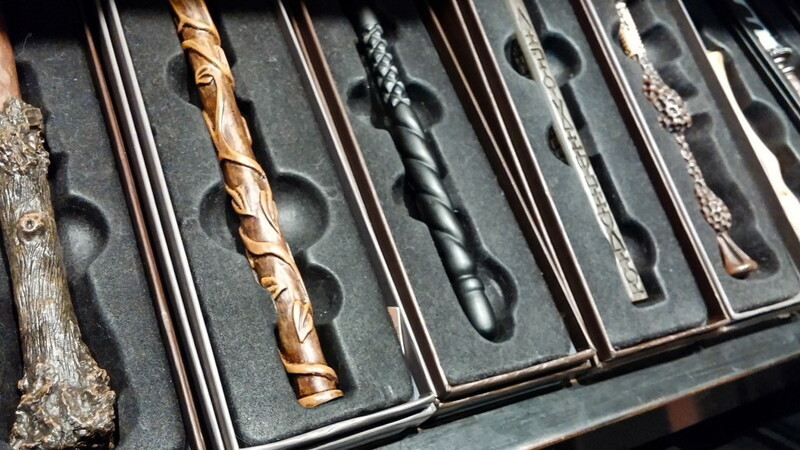 The wand selection here is enormous– you’ll find replica wands from all your favorite characters (good and evil). 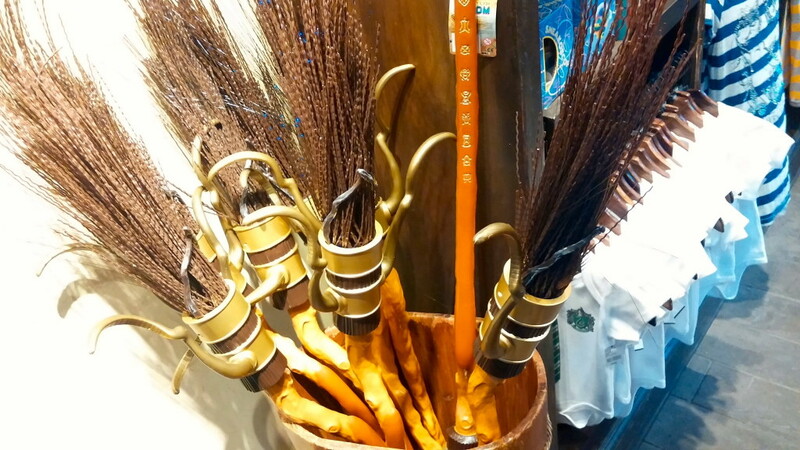 To read more about the interactive wands, hop over to Christa’s awesome post. Plush toys are some of the top sellers here. 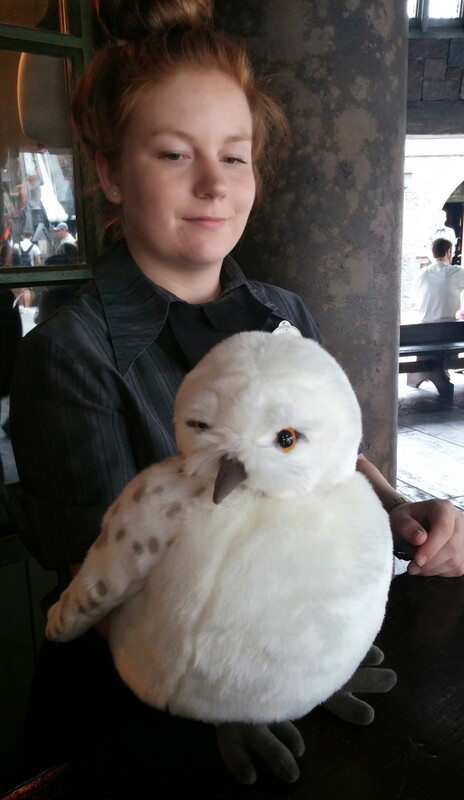 We loved this plump Hedwig puppet (with a movable head that swivels). 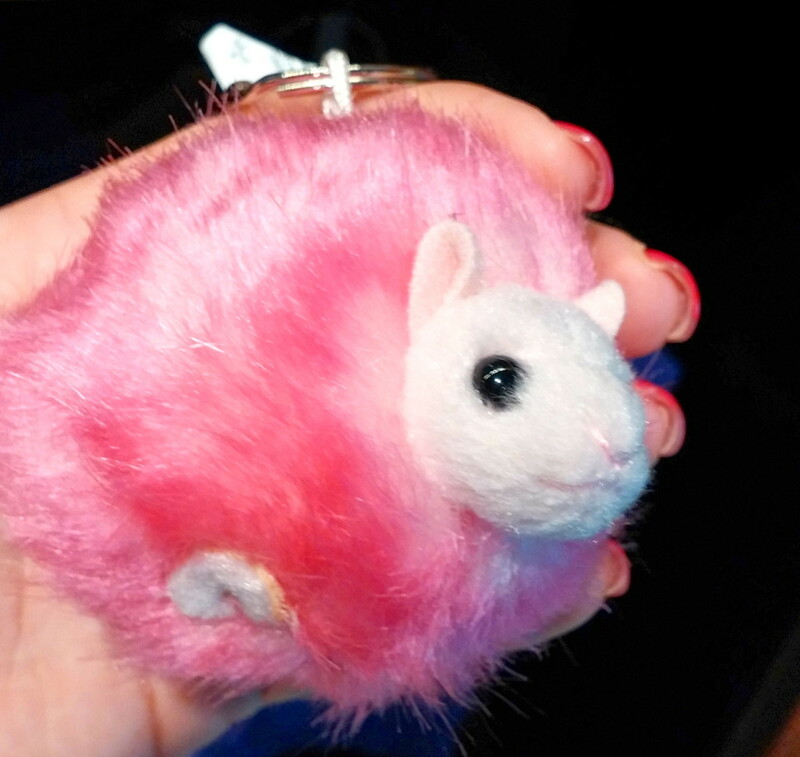 Do these cute pygmy puffs remind anyone else of Star Trek’s tribbles? 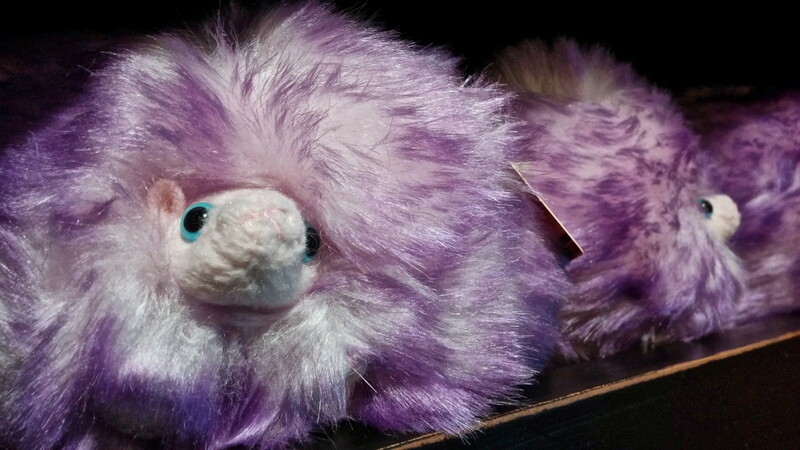 But our favorite plush toys were these adorable pygmy puffs– check out the tiny white feet peeking out from these furballs. Pygmy Puffs even have their own naming ceremony– after you select a name and purchase your pygmy, a shopkeeper will ring a bell and announce the official adoption. For any of these above products, buy online at the official Harry Potter shop. These shopfronts, all based on actual stores from the Harry Potter series, are just empty facades, presumably added in to complete the look of a real shopping village. 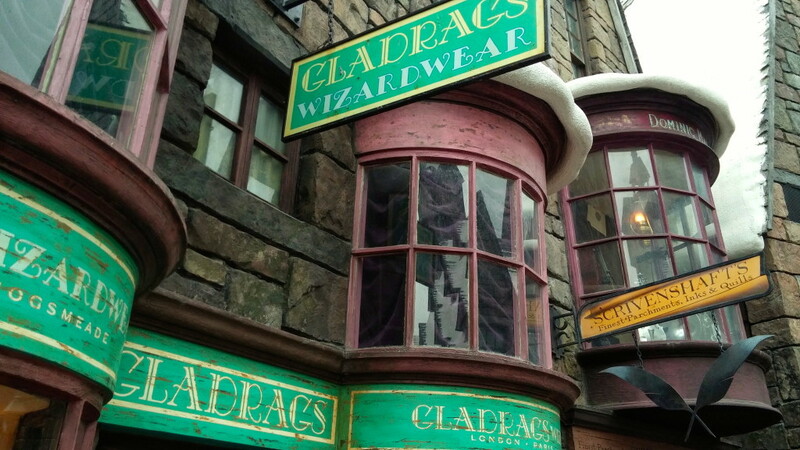 Gladrags is the local clothing store– you may remember that Harry Potter bought Dobby’s birthday present here– a pair of colorful socks. 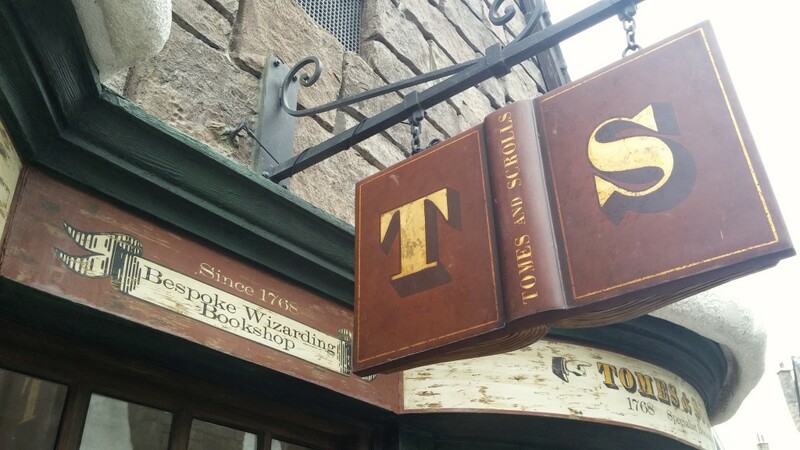 Tomes and Scrolls is a bookstore in Hogsmeade village (peek in the windows to check out the stacks of dusty books). 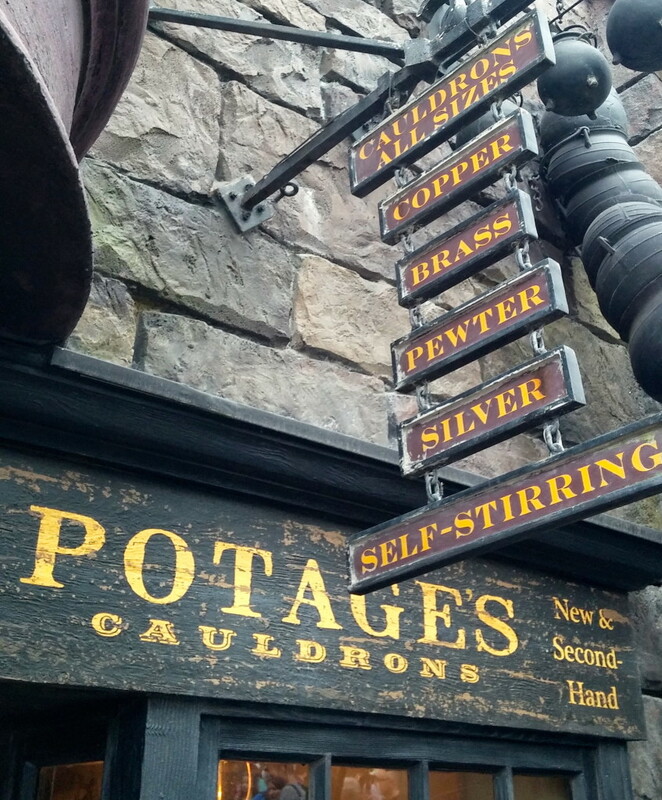 Like the sign says, Potage’s sells cauldrons, both new and second hand. Glad to know that wizards recycle their old cauldrons. Dogweed and Deathcap specializes in exotic herbs, plants and flowers. Borgin and Burkes – find all your “Dark Arts” Harry Potter goods here like those super creepy Death Eater masks. Weasleys’ Wizard Wheezes a light-hearted shop focused on magic, jokes and novelty goods (perfect for the mischievous child or adult). Madam Malkin’s Robes for All Occasions If you want to role play any of your favorite scenes you’ll find all the costumes here, from robes to school uniforms and full on costumes. Wiseacre’s Wizarding Equipment, “scientific” supplies like telescopes, binoculars, compasses, hour glasses and magnifying glasses. Quality Quidditch Supplies— bigger and better. Scribbulus “authentic” feather quills, inkwells, parchment paper, among other items. Expansion to Ollivander’s Wand Shop. 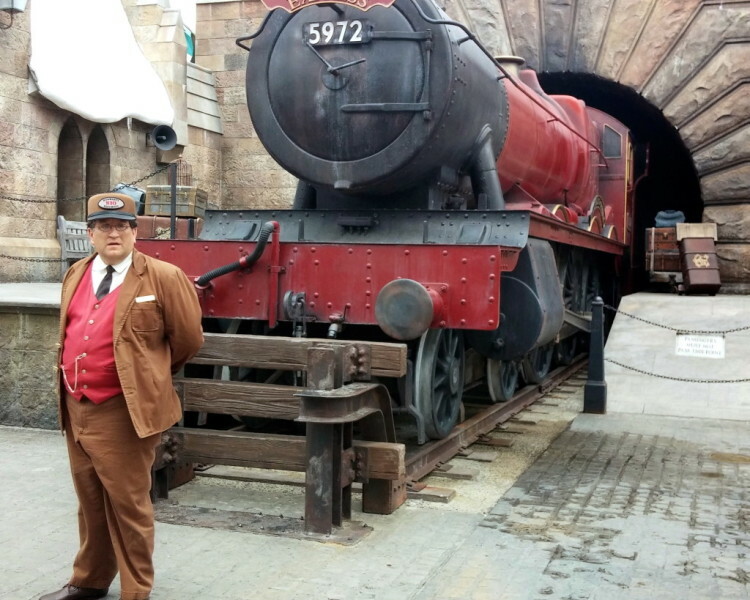 When the Wizarding World of Harry Potter opens its Diagon Alley addition (slated for summer 2014) you can be among the first muggles to get your ticket to the 9 3/4 platform and board the Hogwarts Express train. The train, which is currently stationary, will actually run and connect different areas of the park. 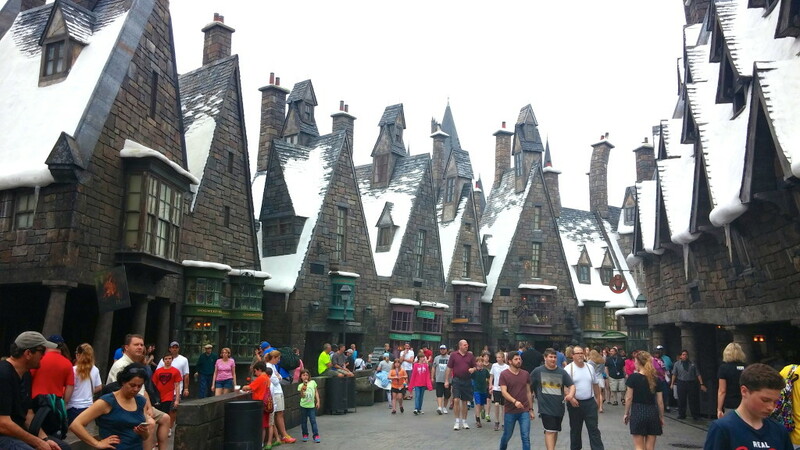 Update: read Christa’s tour of Diagon Alley here! 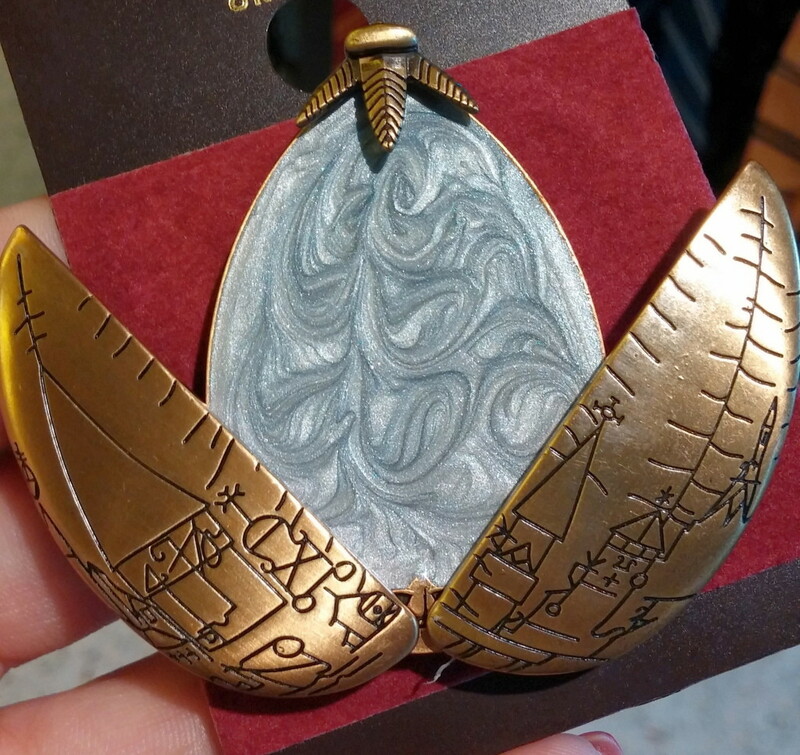 What are your favorite Harry Potter Wizarding World shops and souvenirs? Share in the comments below! Want to buy these souvenirs online? 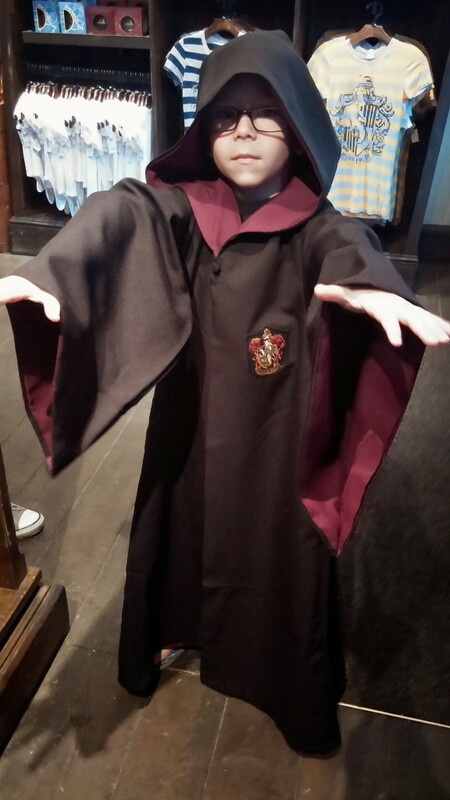 Visit the official Harry Potter gift shop! 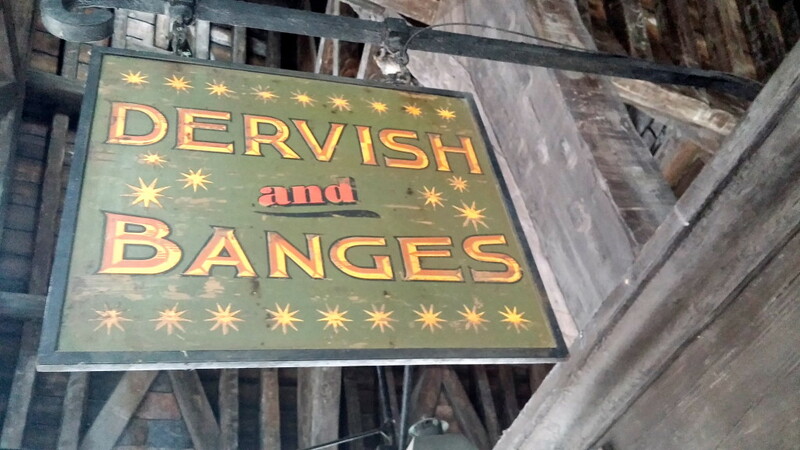 Want to see MORE Harry Potter Souvenirs? Read on about the great Harry Potter items you can find at the Harry Potter Gift Shop at Platform 9 3/4 at King’s Cross Station in London! 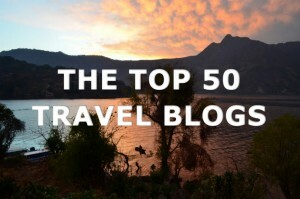 Christa Thompson is the Senior Editor and Founder of The Fairytale Traveler, which combines a passion for travel with fairytales, folk legend, history and myth. 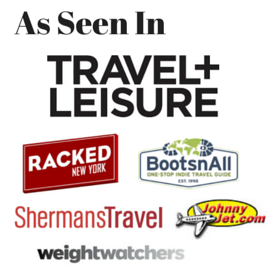 Fairytale Travel is a creative, fantastic, and exciting approach to trip planning– a way to connect with your children and even your inner child by exploring the places that are the catalyst to the greatest stories ever told. 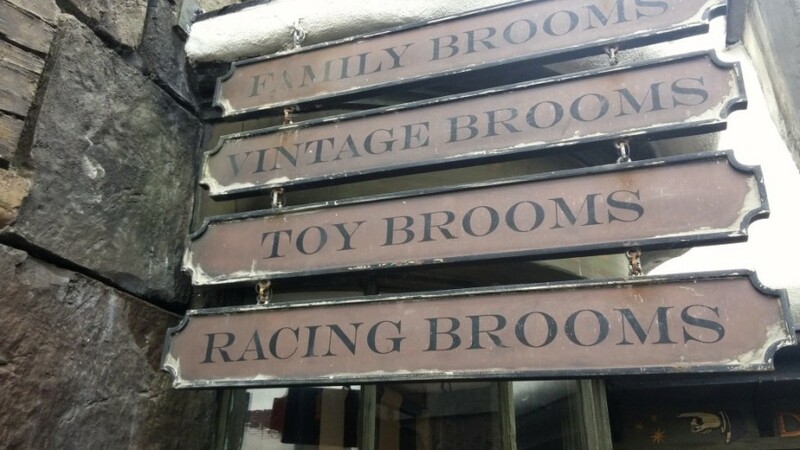 A mint toad and a racing broomstick please and thank you! What a fun post! Wow! I love the Diagon Alley shop! Is this the one in Orlando? I’m going to the Universal Studio in Japan during this summer. yes, this is in Florida. How exciting, I wonder what the Japan one is like! Is there anywhere in Florida to shop for Harry Potter stuff without paying for a ticket to Universal Studios?